​We geared up early this morning and headed to Xfinity for our senior match against St. Mary's. We can't think of a better way to celebrate our seniors than with a big win! With a final score of 84-7, we did just that. Congratulations to everyone who scored a try today (1st photo, from left to right: Deanna Elmendorf, Becca Roseberry, Katie Manganelli, Micaela Ada, Nicole Needelman, Paige Qi, Kimberly Hubscher, Anna Collisahw, and Mackenzie Davis), and to our lovely seniors for a great game! We are so proud of you, and we love you so much! Terps Old and New Come Together! The sun came out on this gloomy morning while current Terps and Terp Alum came together for the annual Alumni game! We had a great time seeing some of our old friends-- and man, do they still got it! After one 7's match and one 10's match, we refueled together with some bagels, and of course took some photos! We are so glad to have such dedicated ruggers that want to continue playing with us even after they've graduated. We love our alumni! We spent the weekend out in the sun at Rosecroft Raceway for the annual Cherry Blossom Tournament! We had a blast playing games and watching rugby all Saturday and Sunday, and came home with two wins (and a whoooole lot of sunburn...ouch!) We are amping up for our alumni game next Saturday-- we can't wait to see some of our old ruggers! Beautiful Day with Mary Wash! It's been an evenful day! We spent our morning in the warm weather playing Mary Washington at home. This was Katie, Makeda, and Heather's first game as a umd rugger, and we couldn't be prouder of them! Congratulations to Deanna Elmendorf for scoring a try today!! After the game, Exec delivered on the Giving Day promise and took a dive in to the McKeldin fountain! It was a perfect way to cool us off after a hard game! At noon, some of us watched the men's team play a round-robin with George Washington and Towson. We love supporting our men's team, especially on a day as beautiful as this one! We had a great time tonight at Georgetown University for the 7's tournament! We played William and Mary, George Washington, and won our final game against Georgetown. Ruggers Mackenzie Davis, Natalie Lambert, Arden Ireland, and Kimberly Hubscher scored tries today! This was the first 7s experience for many of our ruggers, and we loved playing, watching matches, bonding, and learning new things! Thanks Georgetown for a fun time! Had a great time with Longwood! Spring Break doesn't stop us from playing the sport we love! We played Longwood this weekend for a 10's match! Not only was this our first 10s match, it was also the first game for our new rookies! We were so excited to see them play in their first game, and they did great! Mackenzie Davis, Megan O'Brien, and Vanessa Wagener played on Longwood's side, so even if we didn't leave with the win, we're happy that some of our ruggers still got the win for Longwood! We're looking forward to the Georgetown 7's Tournament next Saturday! A HUGE Giving Day Thank You! Giving Day UMD is the biggest fundraising event of the year-- it's a 24 hour frenzy for clubs and organizations to collect the most amount of donations possible! This year, we had our most successful Giving Day yet! We raised a total of cover $6,000 and came in first place for amount of donations out of all club sports, for our first time in Giving Day history! 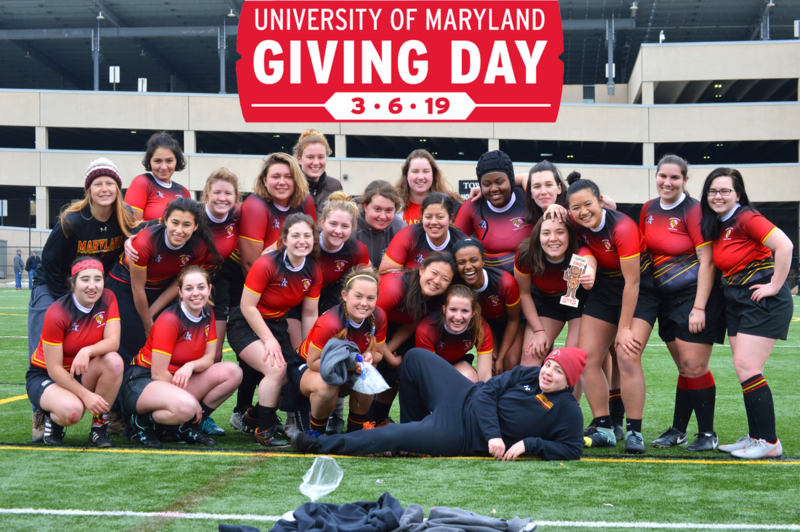 This was a huge goal of ours, and we couldn't have accomplished it without the generosity of our players, their families and friends, out alumni, and other supporters of UMDWRFC! The donations we received will allow us to continue growing our family and give us more opportunities to keep playing the sport we love! We are already pumped to make Giving Day 2020 even better! 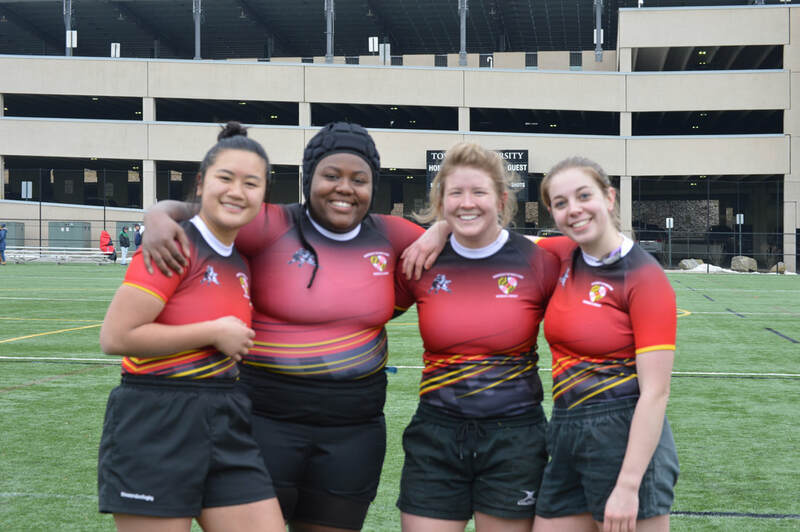 Some of our ruggers travelled to Manheim, Pennsylvania for the annual Frostbite 7's Tournament! Unfortunately, Pennsylvania was hit with some snow, so the tournament was cancelled. But our fun wasn't! We spent the day playing in the snow and exploring downtown Manheim before heading back to UMD. Whether playing rugby or making snow angels, we Terps always have a good time together! First Game of the Spring Season! This past Saturday, we travelled to Towson University for our first game of the spring season and came home with the win! Ruggers (pictured below) Micaela Ada, Shay Hall, Mackenzie Davis, and Natalie Lambert all scored tries today, leading the team to our first victory of the season! We couldn't leave without snapping a pic with the Towson team! 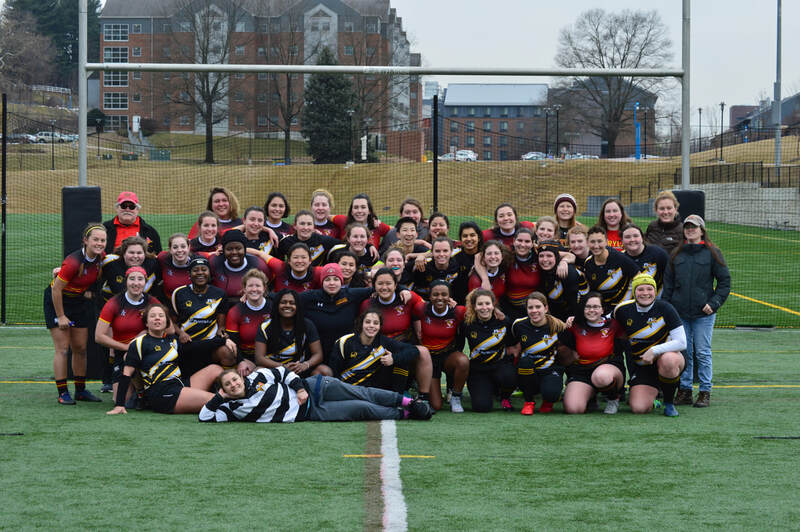 Thank you, Towson Women's Rugby, for a great game and the hospitality! 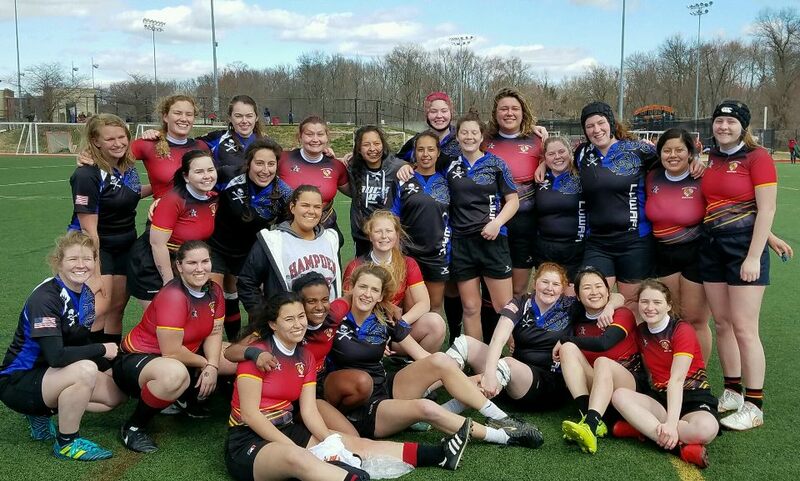 It was a great start to the season, and we are pumped to travel to Pennsylvania for the Frostbite 7's tournament next week! Wish us luck! 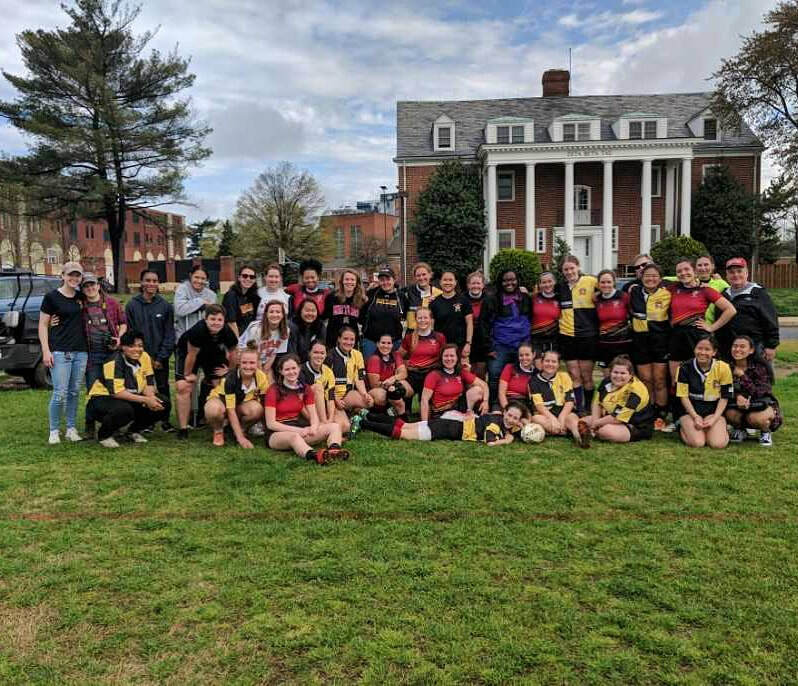 After a great Kick-off BBQ friday night, UMDWRFC came through with a BIG victory versus one of our conference rivals, UMBC. The score was tied 15-15 at the half, but UMD came through with a final score of 42-15! Helping our team start off 1-0 was Nat (2), Nettie, Nika, Mackenzie, Kimberly, Micaela and Paige; who all had tries on the day. Check out some of the photos in our new photo tab! Some of our rookies played either their first ever game as a Terp, or ever. Congratulations to Casey, Arden, Nicole and Kelly! We are lucky to have each of you on our side! We can't wait to take on John Hopkins University this weekend, 9/29 at 10:30 am for our home opener!